A cropduster with an irrational fear of heights sets out to overcome his worries and compete in a major race. 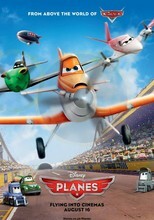 Dusty Crophopper, a plane employed as a crop duster in a cornfield, harbors dreams of becoming a famous racer even though he possesses a fear of extreme heights. Working with a cast of characters such as a retired old war plane by the name of Skipper Riley, Dusty endeavors to overcome his strange worries and prove those trying to compel him to stick to his day job wrong as he trains to become a competitive racer.